Did You Know About 90-minute Coaching Sessions? When I introduced the new 90-minute coaching sessions, I seriously doubted anyone would care. What would be interesting, when two 45-minutes sessions were available? What happened shocked and surprised me--even after nearly 20 years of coaching! Members are LOVING these sessions. The longer sessions allow us to push through resistance, and give us the time to get a ton done. We can roll up our sleeves and do the work. We're talking planning, implementation and execution in one session. Whew! Are you ready to tackle a big project and need time to get it done (with my help)? These 90-minute sessions may be perfect for you. Or maybe a quickie 20-minute session is more your style. Either way, you have options. DIY Weekly Member Update · January 21, 2019 · #420 © 2019 Veronika Noize. All rights reserved. You are going to LOVE our first marketing webinar of 2019! We're talking about tried and true strategies for getting tons of great online reviews. Reviews that help your prospects decide that YOU the one they trust. 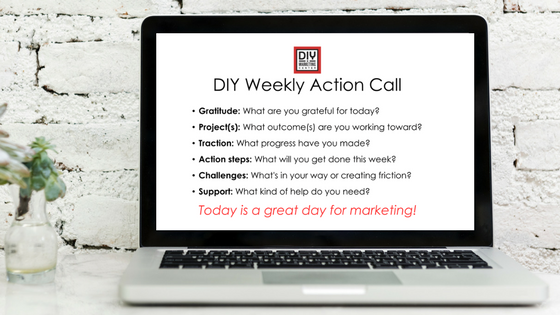 Heads up, gang, there's a NEW DAY for the third Marketing Coaching call of the month! We're meeting on the third Tuesdays of the month at 2 PM. While the day has changed, the deal is that same, with each member getting up to 5 minutes of laser coaching. You know what? A lucky winner every month is so last year. New deal, my friends: We're gonna have a new Lucky Number every week. That's 52 chances for YOU to win. Smaller prizes ($10 in Mastermind Member Money) but lots more winners. Yeah, baby! The catch: You gotta claim it to get it. And you only have 7 days to do so. See all the details on the Member Specials page. DIY Weekly Member Update · January 14, 2019 · #419 © 2019 Veronika Noize. All rights reserved. Please do not Unsubscribe from this members-only weekly email because you will miss out on your membership news, benefits and important notifications! Our first marketing class of 2019 is all about you and your reputation! Would you like to have a ton of great reviews? Reviews are helpful as social proof, but may be hard to get if you don't know these secrets. Join me at the DIY on Friday, January 11 at 12 noon at the DIY. We've got a new meeting room, and you're gonna love this information! The monthly on-site seminar happens on the second Friday at 12 PM. This is right after the on-site Mastermind meeting. The on-site classes have a new location; we're meeting in the UPSTAIRS conference room. Same building, different room. The monthly webinar (which is the virtual version of the seminar) is on the third Thursday at 10 AM. The webinar is free for all members. The slides, notes, and recordings are available to all members within 24 hours of the webinar. 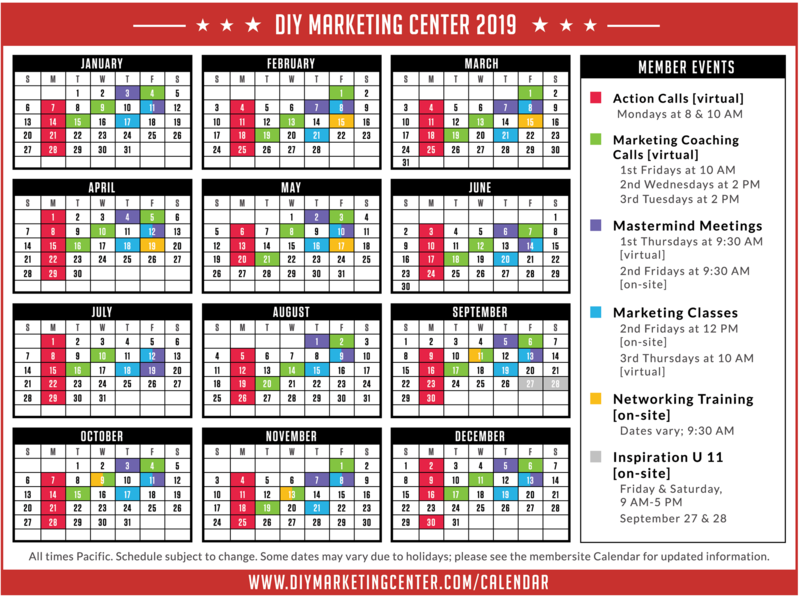 You will find list of upcoming 2019 marketing classes on the Marketing Classes page. You know what? A lucky winner every month is so last year. New deal, my friends: We're gonna have a new Lucky Number every week. That's 52 chances to win. Same deal as before: You gotta claim it to get it. And you only have 7 days to do so. See all the details on the Member Specials page. DIY Weekly Member Update · January 7, 2019 · #418 © 2019 Veronika Noize. All rights reserved. Hey, I am thrilled to introduce the 2019 member events schedule, with upgrades inspired by DIY members. The third Marketing Coaching Call is now on the third Tuesday at 2 PM. The monthly marketing webinar is now on the third Thursday at 10 AM. These changes may seem minor, but I am confident that they will enhance your DIY experience. I've been doing this for 10 years, and I've got a good feeling about 2019. We'll review what worked in 2018 (and what didn't). We'll visualize a better 2019 (and how to make it happen). We'll document our plans, both big picture and a first quarter To-Do list. This is a working session, not a lecture. Be prepared to work, think, plan, ask questions and get feedback. DIY Weekly Member Update · December 31, 2018 · #417 © 2019 Veronika Noize. All rights reserved. Wishing you the very happiest, healthiest, abundant holiday season you can stand! Thank you for your presence, friendship, and participation in 2018. You matter to me, and I am grateful that you are one of us. PS: 2019 is going to be AMAZING!!! Let's get started on it next week! DIY Weekly Member Update · December 24, 2018 · #416 © 2018 Veronika Noize. All rights reserved. => Last call for last meetings of 2018 + did you win? But it all wraps up on Friday, the 21st. Then it's out of the office and on to a week of glorious holiday vacation! Reserve your place at group events through the calendar (links below). Are YOU the Final 2018 Lucky Winner? The Lucky Member ID Number for December is 34216647. The good news: If this is YOUR Member ID, you've won $50 in Mastermind Money (MM$)! All you have to do is CLAIM your prize by phone, email or even a post in our DIY Facebook group by the last day of this month. The bad news: If you do not claim your prize, you won't get it. Bummer! PS: Yeah baby, since the printed newsletter is now quarterly, the Lucky Winner is in the weekly email! DIY Weekly Member Update · December 17, 2018 · #415 © 2018 Veronika Noize. All rights reserved. Want to Keep Your Best Clients Longer? Congratulations! You just landed a new client! Everything is awesome...or is it? Because having a great product or service isn't enough. Most of your clients will fall away, yes, even this happy new one. Unless you have specific strategies for keeping them. Bonus: The notes, slides, audio and video from the webinar version of this class are already posted at Retention. Final On-Site Mastermind Meeting of 2018! Introductions: You get to choose how you introduce yourself for once. Behind the Curtain: How to use our monthly Google Boosters day to get found on Google. Say sayonara to this agenda. Because we have a brand NEW agenda for Masterind meetings in 2019! 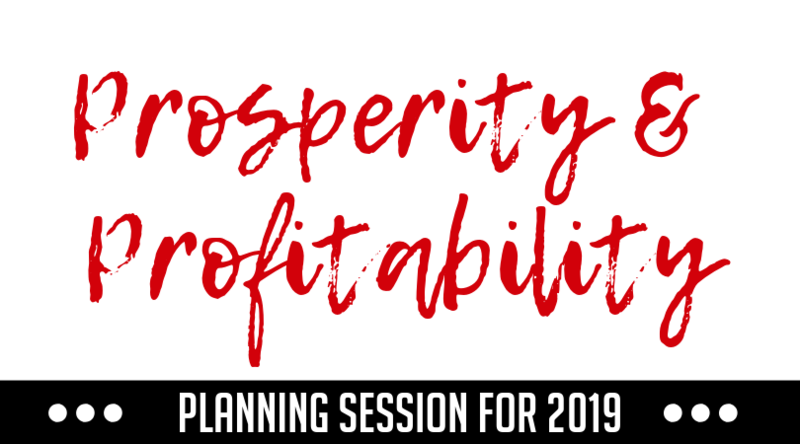 Spoiler alert: You'll get a sneak peek at what's coming in 2019 at this month's meeting. DIY Weekly Member Update · December 10, 2018 · #414 © 2018 Veronika Noize. All rights reserved. Our monthly marketing webinars are open to ALL members. Yes, this means you. This month, we're talking about how to keep your best clients happy, paying and staying. And if you think just offering great service at a "fair" price is enough, you will soooo surprised! Get the strategies, the ideas, and the must-do list at this webinar on Thursday at 10 AM Pacific. Bring your questions, because I've got answers. Want to spend less time networking? Want better results from the time you do spend? Learn two ways to generate qualified referrals who are ready to buy. Get your ticket now for this last class in the 2018 series. Only $25. As the year starts to wind down, I find myself counting my blessings--one of which is YOU! Thank you for everything. I am grateful that you are in my life. Have a lovely long weekend. The DIY will be closed Wednesday through Friday, November 21, 22 and 23; the office reopens on Monday for Action Calls. See you then! Are YOU the November Lucky Winner? The Lucky Member ID Number for November is 2691795. If this is YOUR Member ID, you've won $50 in Mastermind Money (MM$)! All you have to do is CLAIM your prize by phone, email or even a post in our DIY Facebook group by the last day of this month. DIY Weekly Member Update · November 19, 2018 · #411 © 2018 Veronika Noize. All rights reserved.